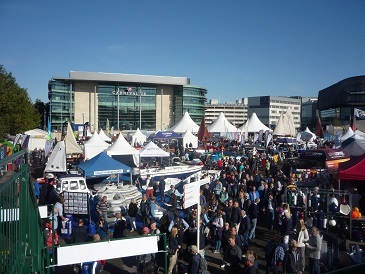 Warmth and bright sunshine were the order of the opening day of the Yacht Market.com Southampton Boat Show. Based in Mayflower Park, next door to the Red Funnel Ferries Terminal, the ten- day event is the first of an initial two years sponsorship deal between British Marine and The Yacht Market.com. 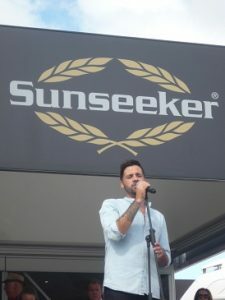 Fashion and lifestyle entrepreneur Millie Mackintosh was on stage in Solent Park to officially open the 49th incarnation of this annual show. 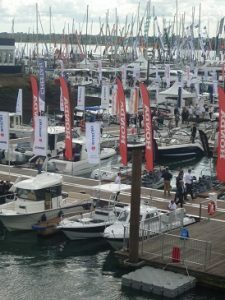 Ventnor based Cheetah Marine have produced some 500 vessels in the last quarter century. On the pontoon, the company unveiled their latest hull design which incorporates marine efficiency and reduced fuel use/costs. 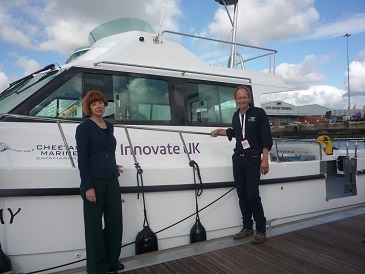 ‘Crystal Spring’ is a result of a collaboration of Cheetah Marine with Southampton University, Innovate UK and Yamaha engines. Innovate UK, sponsor all types of business to find new innovations in design especially those based on environmental issues. On the Sunseeker International stand TV presenter Suzi Perry introduced 2014 X Factor winner Ben Haenow and Colin Jackson CBE. 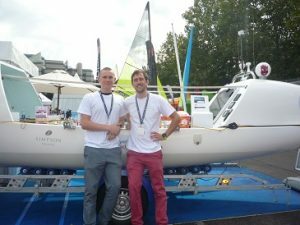 Olympic athlete Colin outlined the work and ideals of the Blue Marine Foundation charity, which has been adopted by Poole based Sunseeker International, now Britain’s biggest boat builder. Blue Marine Foundation have adopted several sites around the World to concentrate their efforts of cleaning the sea and coastline from pollution, one of which is The Solent. Scheduled to depart from Gran Canaria in January 2018 two young rowers will set off to row 3,000 miles across the Atlantic Ocean to raise funds for the British Skin Foundation. 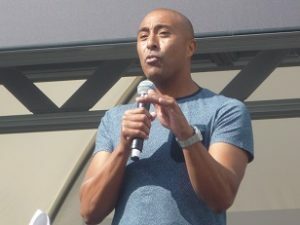 Dubbed ‘The Ocean Brothers’ Dr. Gregory Bailey and Jude Massey are undertaking this daunting project in memory of their late father/stepfather Peter Massey. Both rowers were born on the Island and have Island connections with Gregory’s father owning the Royal Hotel, Ventnor. New title sponsors the yacht Market.com are based in Southampton and have an international platform with some 55,000 boats and yachts for sale valued at $23billion, on the second- hand market being handled by the company. Their new service is to link up with 150 companies to offer a new boat portal. 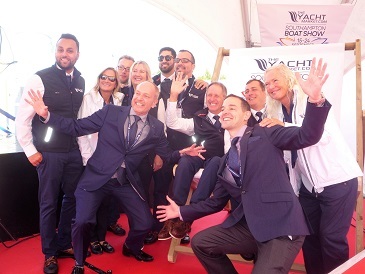 Cowes based Seaward had a new product launch, involving the Seaward 39 motor Yacht and the show saw the launch of the YJA Yachtsman of the Year Award and YJA Young Blogger competition. 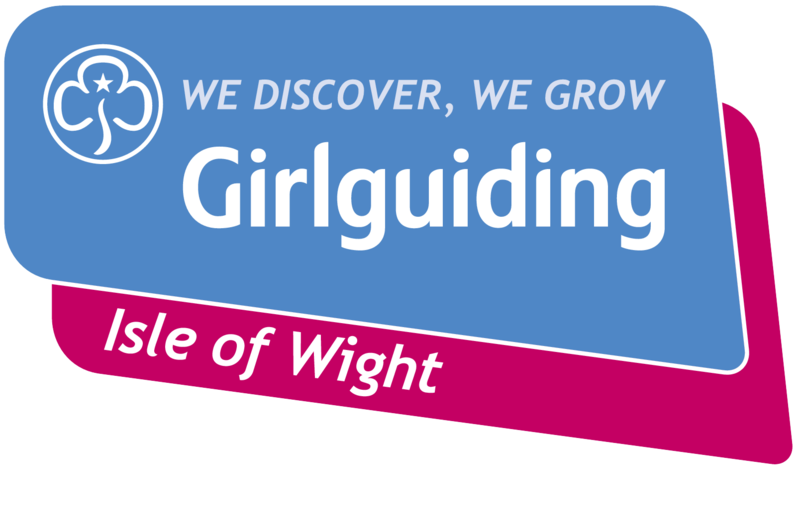 Entries can be accessed on line at www.yja.co.uk and for the Young Bloggers the prize will not only be an I-Phone but advice and encouragement from well-known media personnel including Rick Tomlinson (photographer) from Cowes. MDL Marinas have undertaken a £35million transformation of Ocean Village Marina, Southampton as can be seen from any Red Funnel ferry. Additionally, Harbour Hotels have invested £25million in building the new 5* Southampton Harbour Hotel & Spa boasting 85 bedrooms. Sunsail, whose charter boats are a regular feature of Lendy Cowes Week launched its ‘Funding The Future’ whereby any sailing or yacht club that needs special funding can make a bid. Volvo Ocean race skipper Ian Walker MBE helped launch the project as the first prize includes as evening of live Q&A with him. Opihr Gin has a two- year partnership with Sunsail to provide their gin at sailing events like Lendy Cowes Week and the Yacht Market.com Southampton Boat Show. 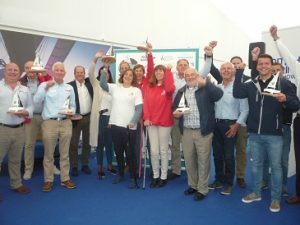 Rounding off the Opening day were the 2017 Sailing Today Awards. Compered by navigation guru Tom Cunliffe from Sailing Today magazine there were fifteen awards in total. Royal Harwich YC, founded in 1843 was chosen as Yacht Club of the Year. David Tydeman of Oyster Yachts gained the lifetime achiever category whilst ‘Sailor of the Year’ went to Tracy Edwards MBE for her ‘Maiden Project’ which will see her round the World yacht-Maiden- restored.